In the late afternoon of May 31, 1970, an earthquake registering 7.75 on the Richter scale struck west of Peru on the floor of the eastern Pacific Ocean. 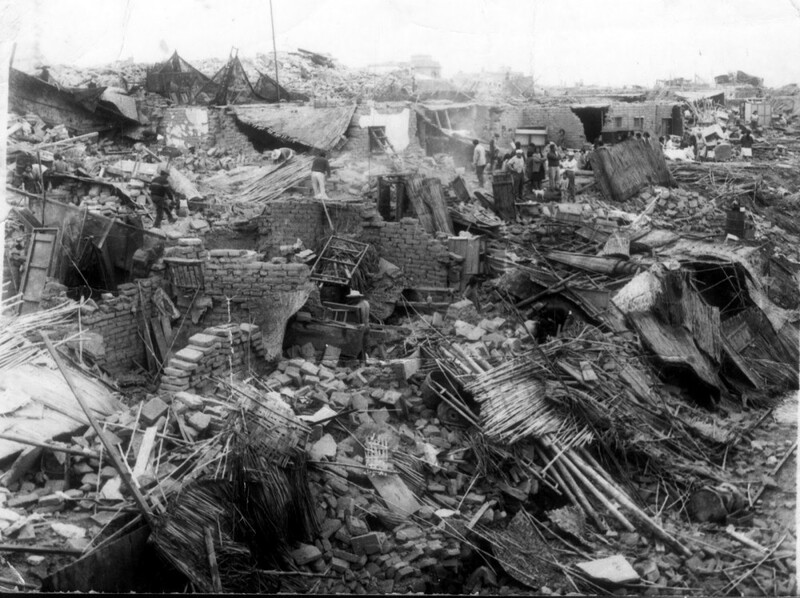 With an epicenter 211 miles northwest of Lima and 12 miles west of Chimbote, the quake devastated the Callejon de Huaylas valley and the towns of Yungay, Huaras, Caras, and Chimbote between the Andes and the Pacific coast. An avalanche on Mt. Huascaran buried 18,000 of the 25,000 residents of Yungay and 10,000 of the 35,000 residents of Huras. The avalanche started as a sliding mass of glacial ice and rock about 3,000 feet wide and one mile long. It swept 11 miles to Yungay at a speed of 100 miles per hour. The fast-moving mass picked up glacial deposits and, by the time it reached Yungay, it is estimated to have consisted of about 80 million cubic yards of water, mud, and rocks. Landslides, mudslides, floods from broken dams, and collapsed buildings killed 70,000 people, injured 100,000, and left 800,000 homeless. Broken bridges and buried roadbeds cut highways and railroads in northwestern Peru isolating the earthquake victims. Peru’s president asked for international assistance, and more than 60 countries responded with emergency relief. On June 1st, the U.S. ambassador to Peru forwarded a request for helicopters and supplies to the U.S. State Department. The U.S. Southern Command, in the Panama Canal Zone, assumed control of the disaster relief operations provided by the United States. Six C-130s from the 317th Tactical Airlift Wing at Lockbourne AFB, Ohio, on rotational duty with the USAF Southern Command, flew 115 tons of relief supplies from Howard and Albrook AFBs in the Canal Zone to Lima. The cargo included two UH-1 helicopters and crews. Four C-123 Providers from the 605th Special Operations Squadron and two 24th Air Transport Squadron C-118s performed similar missions in providing airlift into the devastated area. Between June 2nd and July 3rd, the USAF Southern Command airlifted 689 tons of relief supplies aboard the 12 cargo planes, evacuated 501 injured persons, and transported 2,827 passengers. The Military Airlift Command (MAC) would enter the airlift on June 5th. Two C-133B Cargomasters from the 60th Military Airlift Wing (MAW) at Travis AFB, California, airlifted two special high-altitude CH-47 Army Chinook helicopters and a 1 1/2 ton truck from Harrisburg, Pennsylvania, to Lima. They flew via Dover AFB, Delaware, where crews from the 436th MAW took over, then on to Howard AFB to refuel, and finally delivered their cargo at Lima. That same day, a C-141 from the 437th MAW at Charleston AFB, South Carolina, airlifted 25 helicopter crew members and 13 tons of helicopter support equipment from Harrisburg to Lima. On June 11th, another C-141, from the 438th MAW at McGuire AFB, New Jersey, loaded five tons of equipment including fuel bladders and helicopter transmissions, at Harrisburg and flew to Scott AFB, Illinois. There it picked up another 10 tons of cargo, including 300 tents. It then proceeded to Lima. At the end of the month, a 436th MAW C-133A carried three UH-1 helicopters from Homestead AFB, Florida, to Lima. Between June 5th and the 30th, six MAC cargo planes hauled more than 43 tons of relief equipment and supplies to the Peruvian capital. Our alert came at 6 a.m. on June 6th. We were to crew one of Travis’ C-133Bs that just arrived from Harrisburg, Pennsylvania. Following our crew briefing, within three hours, we were airborne and on our way to Howard AFB, Panama. After 9 1/2 hours in the air and three hours on the ground (for refueling and a bite to eat), we departed Howard for another five-hour flight to Jorge Chavez Airport in Lima. At Howard we picked up an ABC television news crew to report, first hand, of the earthquake’s devastating effects. I recall the reporter inquiring as to the location of Yungay and over my shoulder shooting a motion picture of the area on my navigational chart. A flight over Yungay was out of the question as it was long after sunset and some of the terrain exceeded our flight level. We arrived at the airport at 2 a.m. on the 7th, offloaded our chopper, and headed to our hotel. With only a few hours into our crew rest, we were off to breakfast and to see the sights of Lima. The earthquake had no effect on the shops downtown as the merchants went about their business of selling their tapestries, rugs, and alpaca furs. Of course, most of us had shopping lists from our wives back at Dover. That evening it was entertainment up on the hotel’s roof garden. Along with a group of German tourists, we enjoyed a fine dinner and the exotic sounds of Afro-Andean music. Some of the musical instruments played in Peru today have their origins in Peru’s pre-Columbian history. From the original Andean people, the Incas inherited a variety of wind instruments including flutes and panpipes Then when the Spaniards came to Peru, they brought European stringed instruments such as the guitar, violin, and the harp which the Peruvian musicians quickly adopted by inventing their own versions. The interaction of the African population with the original Peruvian people of the Andes began with the first voyage of Columbus in 1492 and led to the Afro-Andean music culture which thrives in Peru today. Dance performances involve improvised rhythmic foot tapping and slapping accompanied by the guitar, box drum, goat’s hooves, and a stick drawn across the teeth of the jawbone of a donkey’s skull combined with other instruments create the rhythms that accompany the Afro-Andean music. Later the next morning we were again airborne, headed back to Howard AFB. On our return trip, we were scheduled for a crew rest at Howard as from there we were to fly directly to Travis AFB to deliver their airplane without any stops en route. However, our plans were altered over San Antonio, Texas, as an in-flight problem put us on the ground at Kelly AFB for two days. Finally, after visits to the Alamo and other favorite San Antonio attractions, we arrived at Travis six days following our departure from Dover. On June 28th, Mrs. Richard Nixon flew to Peru aboard an 89th Military Airlift Wing VC-137 aircraft with relief supplies donated by private organizations in the United States. Mrs. Nixon toured the devastated area on one of the airlifted CH-47 Chinook helicopters. Sources: U.S. Geological Survey; Haulman, Daniel, Humanitarian Airlift Operations; Pearson Education, Inc.; Heist, Harry, memoirs. My father was a parachuter from Los Angeles that went to help in the 1970 earthquake of Peru. Would like to know if anymore has any pictures of the parachuters. I had one but lost it. His name was James A. Moore. I was stationed at Ft. Gulick in the Canal Zone with the 8th Special forces Group when this occurred. Myself and one other radio operator were sent the morning of the quake to provide communication. Being fluent in Spanish, we also acted as interpreters in the villages. I spent many weeks living in a tent and was there when Patricia Nixon visited. The devastation was incredible. We visited Peru in 2014 and was privileged enough to visit the places where these terrible landslides were. My sister in law lost an great number of relatives and up to now its been hard for her to talk about it. It sounds like your visit to Peru back in June of 1970 was more pleasurable than my own. I was the USAF Combat Control Ssgt who spent weeks camping in Anta to build and control the runway there.